This page starts with the mainline side at Norton Fitzwarren Junction, it then continues on the The_West_Somerset_Railway_side_of_the_junction before moving on to nearby Silk_Mill_crossing (new photos 21-2-05) where the level crossing is being replaced by a bridge, the changes to the signalling will greatly help access to the WSR from the Big Railway. 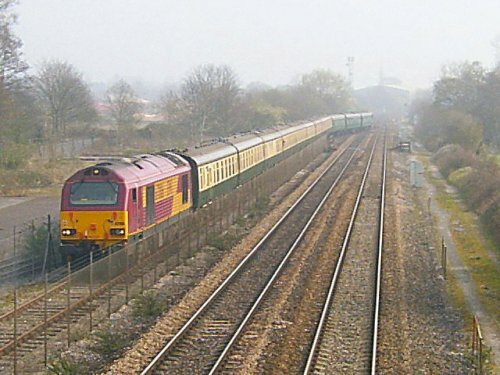 In late June 2002 Wessex Trains were running extra trains between Taunton and Westbury to serve Castle Cary and a bus link to the Glastonbury Festival. 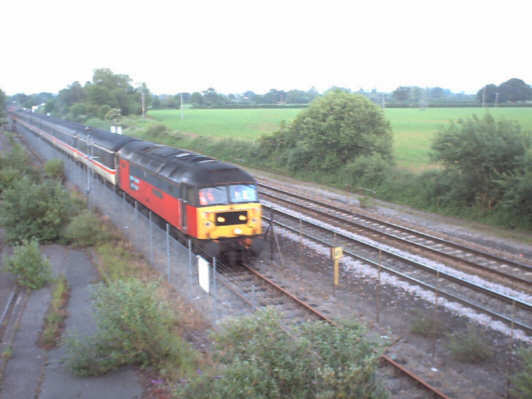 One set used was 7 Mk2 coaches with a pair of EWS Class 47's which were cleaned and stabled overnight at Bishops Lydeard. 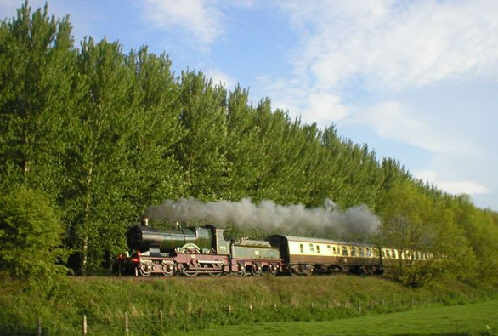 One of the evenings I went down to Norton Fitzwarren to get some shots of them going onto the West Somerset Railway. Further down the page are photos from the WSR side of the boundary. While waiting I got several photos of the "everyday" workings, starting with a First Great Western Inter City 125 heading down from Paddington to Plymouth. The light wasn't kind so many of the shots I tried failed due to the sunshine and shadow mix. Next to attract my attention was EWS's 67021 with a down mail train. A short train for such a powerful machine. 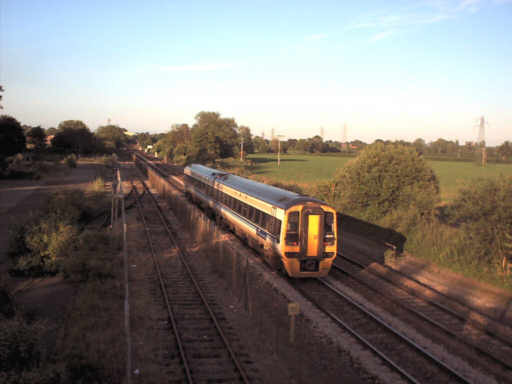 Next to appear was a Wessex Trains Class 158 DMU coming up towards Taunton from Exeter. These units are reasonably fast and comfortable, but somehow a unit just isn't as interesting as a loco. I've included some though, just to complete the picture. A little later 66031 appeared with a short clay train. Short but heavy, it made the old footbridge shake alarmingly as it went by. 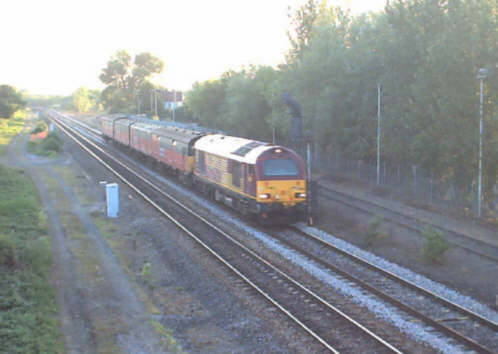 During the time I was waiting there was little sign of a freight renaissance, this being the only one to pass. There were some other 125's about, but the Virgin ones, being darker didn't photograph well so they are absent from this page. Another EWS mail train, this time with 67016 hauling it, headed up as the sun began to go behind the trees, making photography easier. Another First Great Western 125, apart from the leading power car it was all in the new "Barbie" livery. 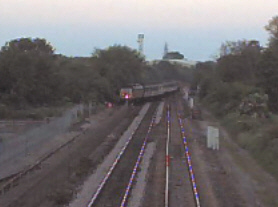 By this time the 47's were waiting for the road, the front end is just visible over the rear of this train. 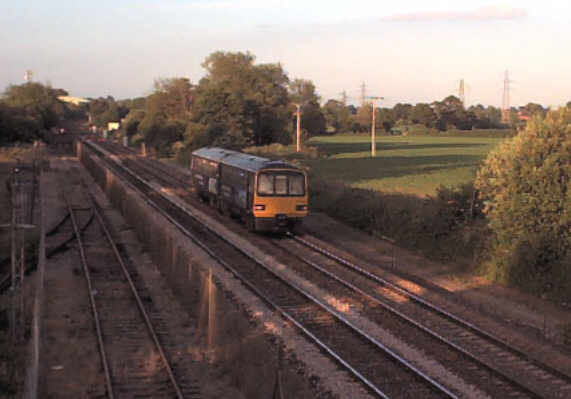 They were still waiting, tantalisingly close, as a Wessex Trains Class 143 Pacer unit - basically two Leyland National buses on rail chassis' -headed west. The delay was waiting for Railtrack's man to arrive to check the train in. 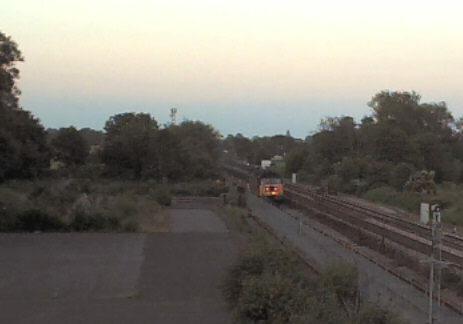 Eventually he arrived and within minutes 47749 Atlantic College led the way over the ladder from the down relief across to the West Somerset Railway's line, by which time the light was beginning to fail but here she is. They made very slow progress, just creeping in over the crossovers, so there was time to change position and get another view of the manoeuvre. Closer too getting the light right was easier, a last view of Atlantic College as she passed the fenced off entrance to the old cider factory, one rail of which can be seen on the left set in the concrete of the derelict yard. Also in view is Milepost 165 from Paddington via Bristol. A last shot of the evening saw 47789 Lindisfarne being dragged along on the back - a very appropriately named loco for a train in connection with a music festival. 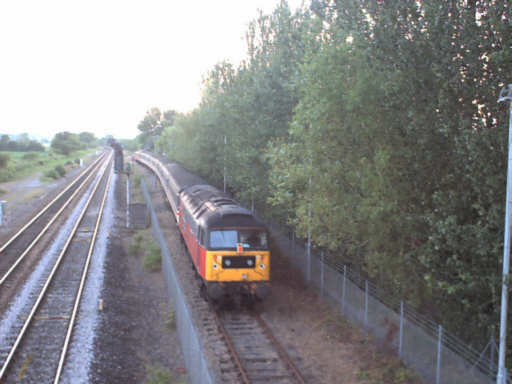 The front of the train is just about up to the (then) Railtrack/West Somerset Railway boundary, you can tell how little used the link is from the rust still on the rails after 2 locos and 7 coaches had passed over the line and also from the way the train is brushing the trees. 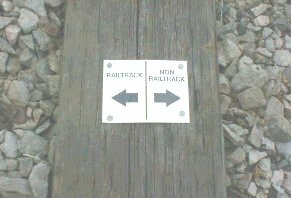 Once Network Rail resignals the connection so that the presence of someone to check "train in and complete" isn't needed this section of track will hopefully see much more activity. 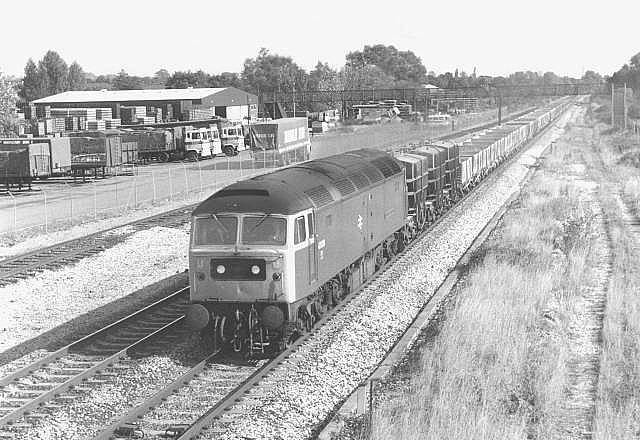 To conclude the mainline side, a 1980 view by Steve Edge of 47076 City of Truro passing Norton Fitzwarren with a down china clay empties train. 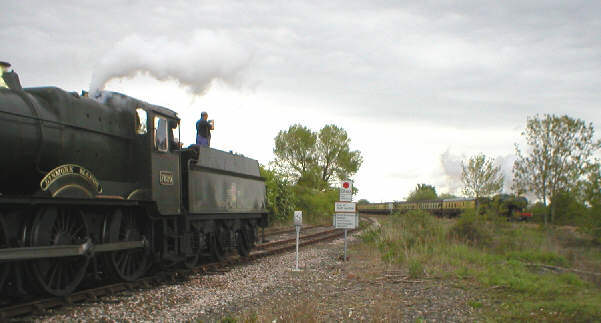 This loco is featured above under its current identity of 47749 Atlantic College. It was taken from the former station footbridge, the bridge in the background was my vantage point for the photos above. See further down for the real City of Truro! 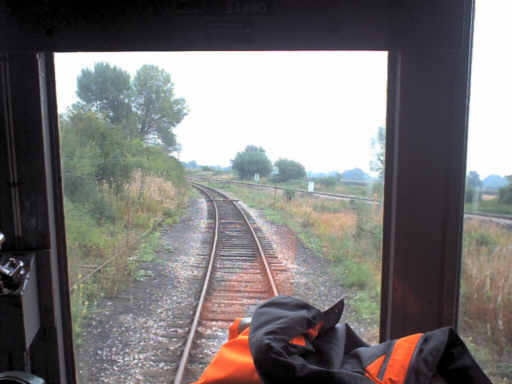 The view through the cab of a West Somerset Railway DMU drawn up tight to the "Stop" board, with the sleeper barrier visible further along the line and the mainline also visible. 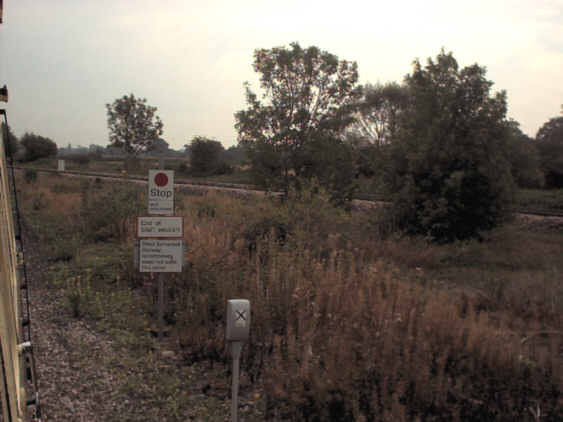 A view from the train of the "Stop" board, which can be seen better from the ground in the right hand view by Jon Tooke. Another of Jon's photos, showing the way the Railtrack/West Somerset Railway boundary is marked on a sleeper. This next one is a montage of three shots showing a First Great Western HST disappearing on the left and the empty space that exists between the mainline and the WSR's line, including the course of the former Barnstaple line. Another view, also from a train, showing more of the space that is available at Norton. 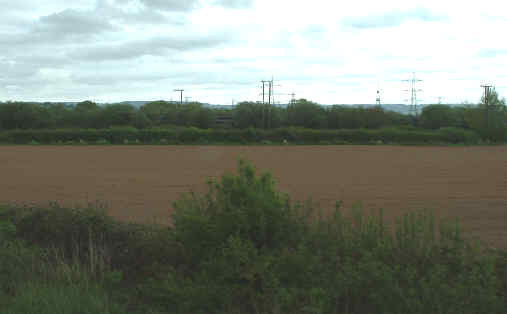 The West Somerset Railway Association has bought 33 acres of land here, including the area seen here, for more details about this see Stop Press. 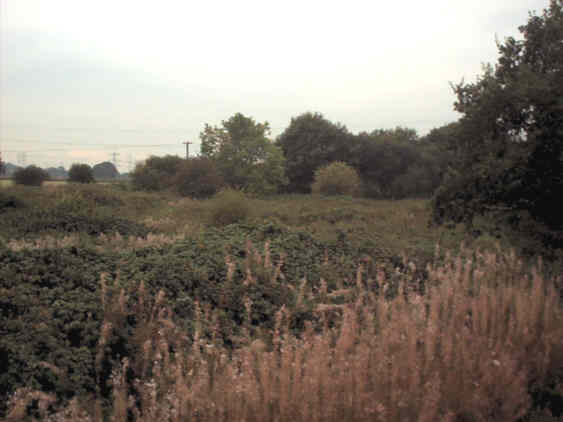 This view shows more of the the site the WSRA has acquired, there's a First Great Western HST hiding behind the far hedge, but it's hard to spot. 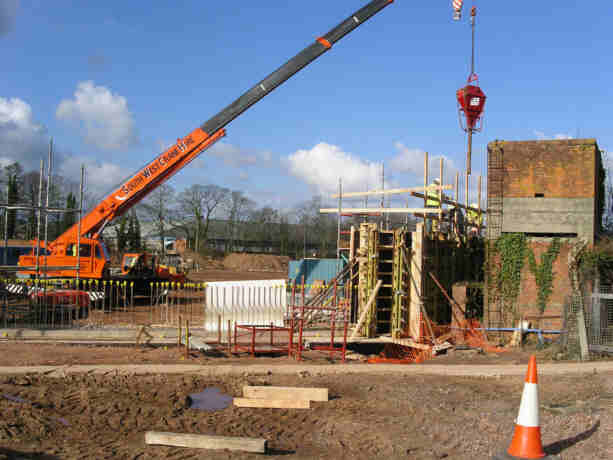 As mentioned above the level crossing over Silk Mill Road is being replaced with a bridge, these photos by Jeff Treece show the work under way on 15 February 2005. 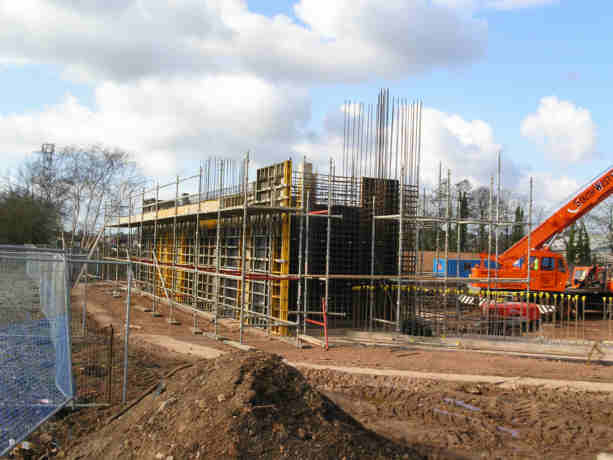 Substantial piers are needed as the bridge will allow space for 5 rail tracks plus the Grand Western Canal should that ever be reopened at this end. 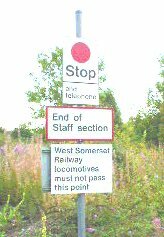 5 tracks have been provided for in case the West Somerset Railway ever extends besides the Network Rail lines into Taunton. 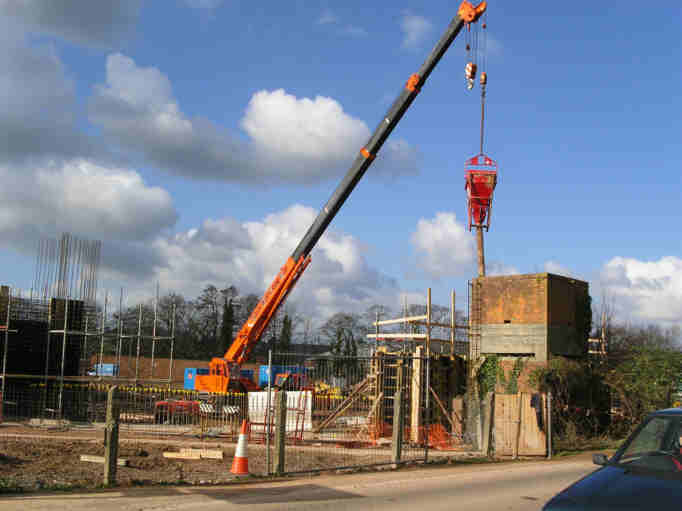 The wartime tower beside the line, seen in this and the first photo, is being preserved. 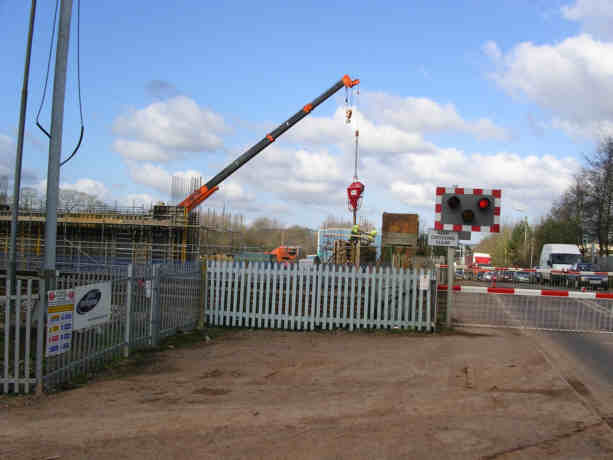 The last shot shows the soon to be replaced level crossing with a typical queue of traffic waiting for a train. The new bridge will improve access to the WSR by road as well as by rail!